Welcome to Sweet Dress Up where everything is cute, from the characters to the clothes! Create the most adorable outfits by mixing and matching with hundreds of clothes and accessories! 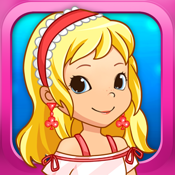 ❤ Choose from 4 different girls - it's like 4 dress up games in one! ❤ Thousands of combinations! Mix and match! With hundreds of different items, you'll be addicted to making cute looks and sharing them with your friends!